Good food can be a powerful memory trigger: sometimes a single pungent whiff releases recollections of long nights of exam cramming, or with one or two garlicky bites one is instantly transported back to a crowded Italian trattoria. Comfort Food for Breakups is a celebration of the sometimes painful, sometimes passionate interconnections between food and memories. Bociurkiw, also the author of a blog entitled Recipes for Trouble, is a filmmaker, lesbian, and global wanderer with a Ukrainian heritage. She offers a collection of twenty-four food-inspired autobiographical pieces, grouped under headings such as “Mama’s Kitchen and Beyond” and “Food Voyages.” Some of the short pieces, which cover topics ranging from chocolate to vegetable curry, are accompanied by relevant recipes. The result is occasionally disjointed, as when Bociurkiw jumps from the yellow snow of Chernobyl in one paragraph to her mother’s tomatoes and flowers in the next. Overall, however, dipping into this diverse collection is an appetite-stirring experience. Bociurkiw is an accomplished cook who also writes vividly. Her account of traveling by bus through “the wide primordial Anatolian plain” of Turkey is wonderfully evocative: “Unknown sage-green rivers will pass by your window, and the slow-motion, early morning movements of villagers carrying loaves of bread, sending children off to school, or glancing up from cafés will stir you to wonder.” She goes on to describe with passion the food served by a small pension at her otherwise disappointing destination. Elsewhere she recounts with gentle humor a long evening of good food and fine conversation, the unexpected result of an undercooked turkey. Her piece on “Sunday Soup” recalls both the potato-peel soup devoured by her hungry father in a Nazi concentration camp, and the “leaden, bland, and curiously grey” pea soup dished up during her childhood summers at a Ukrainian camp in Alberta. The accompanying recipe is far removed from such unappetizing offerings: it’s for a thick, comforting, vegetable-laden minestrone. All the dozen or so recipes have clear instructions and most are not overly complicated. There are simple, comfort-food dishes, such as mushroom sauce and Down East Fish Hash, as well as more elaborate offerings, including Terri’s Transcarpathian Varennyky and a decadent flourless chocolate cake that calls for eight eggs and a full pound of butter. Many of the stories of Bociurkiw’s life and love affairs revolve around the enjoyment of food, and her writing, even when it concerns painful incidents and difficult relationships, is insightful. 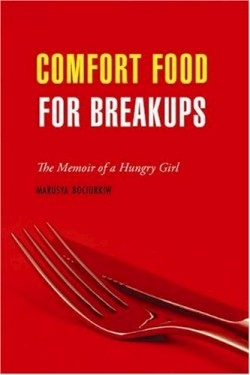 Comfort Food for Breakups is a satisfying collection of culinary reminiscences spiced with tempting recipes.